On 8th November 2017, about a year after its grand opening, the Louvre Abu Dhabi was inaugurated by Sheikh Khalifa bin Zayed Al Nahayan, President of the United Arab Emirates. The museum, which maintains close relations with the Louvre in Paris, was built on the island of Saadiyat in accordance with a design by French architect, Jean Nouvel. The client chose the TCB-RB passive chilled beam from TROX UK for the important task of cooling the 24,000 m2 administrative building in the desert climate of the Arabian peninsula. Developed and built in the UK, the TROX TCB-RB is a passive chilled beam designed to be installed under the ceiling (and is available in various widths, heights and lengths). The air-water system is particularly suited for the dissipation of high thermal loads with low power consumption. TROX is leading in the development, manufacture and sale of components, units and systems for the ventilation and air conditioning of rooms. With 27 subsidiary companies in 27 countries on 5 continents, 14 production facilities, and importers and representatives, TROX is present in over 70 countries. 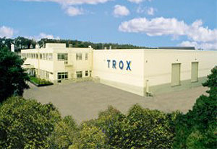 Founded in 1951, global market leader TROX, whose international head office is in Germany, generated in 2016 with a total of 3,770 employees around the globe revenues of approximately €500 million.